I’ll publish some of my problems here and I’d be happy to receive yours! Diagrams, comments, new ideas, anything to discuss – are very appreciated! No.33 – hs#2,5 by Nikola Predgrag – a modification of Dentist-theme realized by Bishop-Locust, Rook-Locust and promoted black S/R as forward battery-pieces. Author welcomes any improvements of the problem. No.33.1 – hs#3 by Nikola Predgrag & Petko A.Petkov – an improved version of No.33, agreed with the both authors after the comment by P.Petkov as of 05-Jul below. Agreed with the both authors and added from the comment by Petko Petkov to the problem No.33 as of 05-Jul below. You have shown very neatly the unpin of WQ with 2 underpromotions and a good play by LR/LB. The last mating moves by BS & BR are very interesting. Can we call that an indirect black battery fires? I am not sure what a fairy-theory says. For me, after the moves Sd3/Rd1, the wQ is unpinned and direct masked batteries are formed. When the ‘mask’ (wQ) vacates the lines of the respective bLR/bLB there are direct batteries which fire and mate. The specific of the Locust-family is a battery where the attacked piece is between the rear and front battery piece.. They are direct batteries (i.e. aimed at the king), specific to Locusts (as the firing pieces are behind the attacked pieces). The similar play is for example present in h#2 with locusts by Harry Fougiaxis. The 22nd TT CCM was even dedicated to this specific battery of locust-like pieces. Do you know whether such specific ‘Locust-Dentist’ content has been much explored? This is something I’m interested in as well! h#2 with locusts by Harry Fougiaxis from Juraj’s comment shows the effect of using Locusts in battery play, but not in Dentist-mechanism, which is specific for s# or hs#. I’ve looked in WinChloe Echecs database. There’re 41 problems of hs# with Locusts. Dentist is not shown among the themes… but maybe it is not found by the program for some reason. Well, then it might be worth to try a more complex specific ‘Locust-Dentist’ content in s# or hs#. 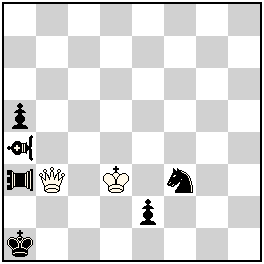 a) A thematic line “x” with the initial position of the figures (two white and one black): the white King, the white pinned piece “X”, and the black figure “Y” which executes the pin. bb) unpins “X” which moves and the battery Z/Y gives mate! This clasic and very old form of Dentist is well known from selfmate-genre and its development in the genre HS# (HS=, etc) poses no difficulty. A simple and mechanical transmission of typical S# schemes in the genre HS# does not represent any interest. Such an approach here could lead only to the predecessors – a typical and rather unpleasant moment here. Therefore, the Dentist theme should be realized in HS# genre more complex – in a form that is inapplicable in selfmates. There are many ways to complicate the Dentist and one of them is, of course, the promotion of the black figure “Z”, but not on the thematic line “x”. By the by, the use of fairy figures here is a way to demonstrate a new interpretation but I recommend also to search ways for complexity of Dentist – as a set of different interesting motifs. Predrag`s problem demonstrates nice play typical for batteries, created with Locust. In my opinion here we have a nonstandard form of Dentist because in the initial setting we should promote a black Pawn, not on the thematic line, which executes the “Z – role” but executing two half-moves! This is a nice and relatively new moment. But generally, the problem creates the impression of something incomplete.Of course, the bad thing here is the technical role of Sf3. On another hand, the both solutions are not full adequate in thematic attitude. In the solution sfter 1….e1R 2. Kc2 we have a different motive – the white King leaves the original thematic line and arrives at another thematic line! This is an original moment , but it is obvious that the full thematic adequacy doesn’t exist here between the both solutions. At first, here we have a complicated, nonstandard form of the Dentist – the typical Dentist mechanism doesn’t exist in the initial setting – it should be created first! The w.Q is not pinned piece! The first white moves create a Dentist mechanism through pinnings of the white Queen! This is of course a paradoxical moment here. A good additional moment is also the surprising play of white K/Q battery. c) Sb2 and Sc2 – guard the squares around the black King but in reciprocal roles – in one solution Sb2 is static, Sc2 is dynamic, in the other – on the contrary. By the by, such multiple interchange of function was the theme in the world known Romanian T.T. Tzuika – 2011. I plan to publish a special article about Dentist theme in HS# genre, where I hope to show the most interesting modifications of this theme that are completely new field with huge possibilities in HS#. Thanks for the comment and the improvement/enrichement! I was aware of the mentioned weaknesses and I had a doubt whether to publish it as original or only as a scheme/illustration of specific Locust-Dentist mechanism which should be enriched yet. Since our precious host Julia deserves the originals on the site I sent it as an original and welcomed the possible improvements. After all, it’s a white minimal with 2 underpromotions rendering the Dentist on 2 lines in 2 solutions with 8 pieces. But the promotions were not my intention, at first I hoped that bS and bR would already be present on the diagram and that they would reciprocate their functions. Due to my poor experience in fairies, I spent a lot of time without satisfying result. The promotions came just as a tool to achieve the correctness and unique order of moves. Static bSf3 is certainly annoying and the already pinned wQ on the diagram was indeed not my intention. I hoped that with 3 white moves, wK could come to the final squares but I could not avoid the repeated 1.Kd3 in both phases. My final hope was rather interesting. The same diagram with stipulation h#3; 2.1…. gives the change of the pinning line in the 2nd move, after the 1st move played for tempo. But to avoid a cook/dual 1.Kc4, the square c4 should be guarded. 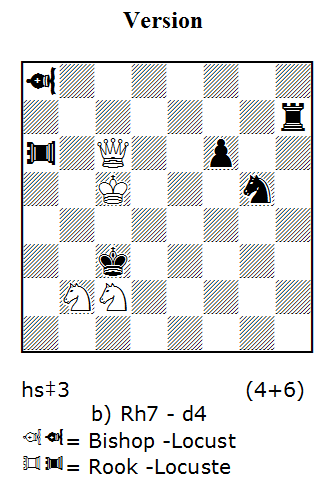 Additional bPb5 could correct this but then, 3… Sxb2# would be only the line-opening move, not the guard of c4 (the only square guarded by bSb2 in that mate could be d3 – if bP is on e3 but then d3 would not be guarded in the other phase). Increasing the number of moves looked as mandatory for any improvements, but more moves should add more content. I’m happy that the magic Petko’s touch has brought such improvemenet and enrichment by adding only a half-move. I’ll give here a correct scheme (without my authorship) which shows a funny anticipatory Dentist-unpin of wP which at the first glance is never pinned. But the specific fairy condition indeed pins it after all. If anyone could make a problem of it, go ahead. I like Petko’s version a lot too! Should I publish it as a joint problem? No.33 is on the margin of being the original or only example. So I take it as ‘original example’, not a ‘full-blooded’ composition but still showing some original combinations of the elements (I hope). The major insufficiency is the lack of white play. 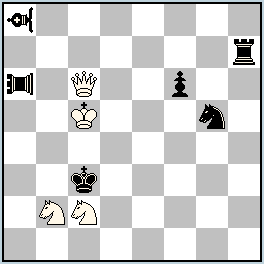 A minimum of white play is shown in the move 2.Kc2 – a diagonal selfpin of wQ, but 2.Kc3 has no such strategic component. My intention was to initiate the composers to explore the specific possibilities of Locust-Dentist content, so I illustrared it by the ‘original example’ No.33. Mr. Petkov presents 2-phase thematic play by wK with additional reciprocity of wS’s. I don’t see it as a version, it is perfectly normal to treat it as a complete original, initiated by an example. It is usual in thematic tournaments, the authors of the awarded problems do not share the authorship with the authors of the examples given in the announcement. I would be honoured as the co-author with Petko Petkov, but my contribution is only theoretical. I don’t consider my No.35 as a version of No.33, but as a new original.